Saint George, Martyr - My Catholic Life! 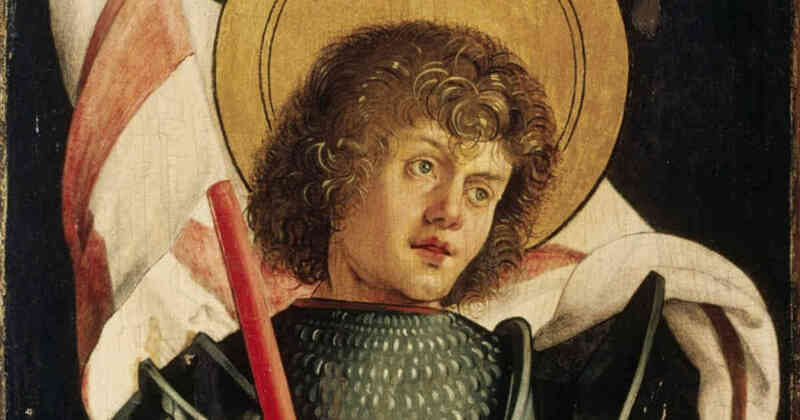 Saint George suffered martyrdom in Palestine before the reign of Constantine. And that is all that can be said with certainty about Saint George. Yet where the documentary record is lacking, other traditions suffice. No one, after all, can document why we blow out candles on a birthday cake, where this nearly universal custom originated, or in what century it even began. Someone, somewhere, for some reason, thought it was a lovely thing to do, and started doing it, otherwise it would not be done today. But questions of where, when, and why fade when friends and family gather around their loved one in the dark, the simple joy on their faces captured in the flickering of the candlelight. Knowing the origin of a tradition matters, since it may reveal unappreciated depths to a common practice. But that a healthy tradition continues is more significant than knowing, or explaining, where it came from. Few Christians can explain the hypostatic union, but everyone loves to unwrap a gift on Christmas morning. No one can determine where and when Saint Valentine lived and died, but our lips broaden into a smile when we open a card on Saint Valentine’s Day. A good tradition conveys meaning implicitly whether its origin is obscure or not. If traditions age like wine, then the traditions surrounding Saint George are of the rarest vintage. Devotion to Saint George is so ancient, so deeply rooted, and so cross cultural that to argue that it rose like a chimera from the hot desert sands would be ridiculous. In the remote valleys of the Judean Desert east of Jerusalem, clinging to the copper-colored cliffs shooting straight up from a wadi, is an ancient monastery named Saint George. It was founded in the fifth century. And amid the stately Roman ruins of Jerash, in Jordan, are the remaining stone walls and mosaic floors of the Church of Saint George, built around 530 A.D. Official devotion to Saint George manifests itself, then, in some of the oldest Christian structures in the Holy Land. The murky origins of these early buildings merged with written traditions from centuries after George’s death until, over time, Saint George was known as a chivalrous knight who died for his faith under the Emperor Diocletian. The lore of a mounted warrior for Christ was immensely appealing to the Crusaders who populated the Holy Land in the twelfth and thirteenth centuries. They transported the hagiography of Saint George back to Europe with them. Oral tradition and popular custom then did its slow work until the ancient Palestinian devotion to Saint George was revived in a new age for new people in new lands. From the Byzantine east to the Latin west, from the Mediterranean south to the Saxon north, few saints became as popular as Saint George. He was named the patron of an enormous number of castles, kingdoms, churches, abbeys, cities, and orders, and even of England itself, where his dragon-slaying exploits still resonate in that country’s national mythology. Traditions hold that Saint George was among the many soldier-martyrs of early Christianity who, instead of dying to protect the Emperor, were killed on the Emperor’s orders for refusing to deny Christ. A loyal soldier obeys his master and is prepared to offer his life for a higher good. Roman soldiers were naturally prepared to die for the faith, and many did, killed by their fellows perhaps with some regret. Though the legends swirling around Saint George cannot be verified, they have been accepted by the faithful of many nations for many centuries. Acceptance of traditions is a cultural sieve straining chunks of absurdity from the liquid truth. Saint George has passed through that filter all the stronger. He died for the faith when many of his contemporaries did not—and only the greatest of men did that. 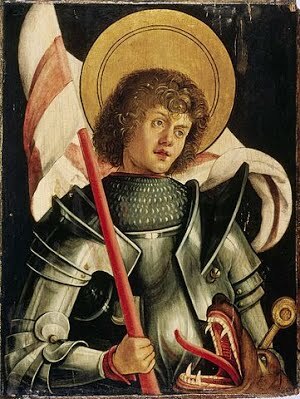 Saint George, you were a loyal soldier and humble Christian who gave your life for Christ. Inspire us to have your same loyalty, your same courage, and your same nobility to die for a mighty cause, whether all at once or bit by bit over time.